Half of My Henna Prints (a giveaway!) – closed. EDIT: COMMENTS CLOSED. Thank you to everyone who entered the giveaway! Ever since I received that adorable hexie needle book as a gift, I’ve been thinking about henna prints. 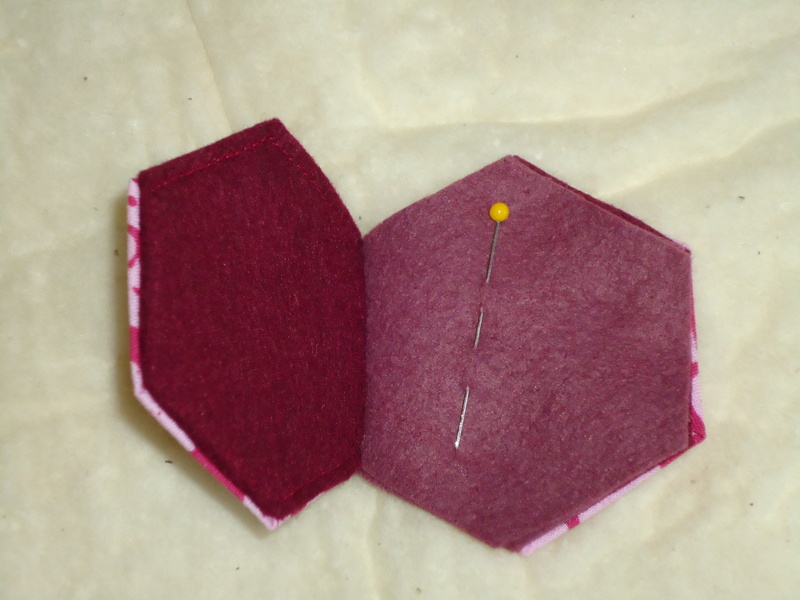 I decided to make several hexagon needle books in the various colors of henna scraps I could find in my sewing room. I really like having a stash of gifts for those last-minute occasions when I need a handmade gift but find myself short on time. Then I decided it would be fun to order more henna prints, and give away a fat quarter of each of these prints I could find (note: these prints are not the exact same colors as the needle books I made). Leave me a comment by Friday, October 8, 2010 (10:00 pm CST) if you are interested in winning these goodies. International entries welcome. Let me know which color hexagon needle book pictured at the top you would like. You will receive that needle book and a set of fat quarters in the prints shown here. I thought a giveaway might be a fun way to celebrate American Craft Week! what a awesome giveaway…whenever asked what is my favorite print…THIS is the one that always pops into my mind first. I love that she keeps including this one in her collections…love all the colors…your far right, light gray needle books is my favorite…im entering into a gray period…AND i don’t have that color of henna garden!! thanks for my chance terri! I LOVE those prints. And the blue is my favorite – so I would love the blue needle book. I am always interested in winning goodies! All the hexagon needle books look great. I think this print is a perfect choice for making those. If I *have* to pick a favorite, I guess I’ll choose the raspberry looking one, second from the right. But actually, I love all of them in the photo! Thanks for letting us know about American Craft Week. I had no idea! Dearest Terri, these fabrics are gorgeous!! I really adore your hexie needle book…adorable! Have a lovely merry happy week and love to you! Those needle books are adorable! Even if you didn’t use them as a needle book, I think they’d make a great keychain, lol! Fantastic!! I love the needlebooks-how sweet of you to do a giveaway! I love all of the colors-but grey is always my go-to! HOWEVER, IF I were chosen, I’d be blissfully happy with ANY of them! These needle books are all so cute…think the blue is my favorite! What a great give-away! You are the bestest! Your needlebooks are awesome and I love love love them all. I love the extra little loopy thing you have on them too, what a great add. Have a great week. As you know, henna garden is one of my most favorite fabrics. Ever. I love the orange needle book right in the center. You are so generous! You know how I love Sandi’s Henna Garden! I really like the cherry red (I think she calls it pomegranate)… Oh, how I am crossing my fingers for this giveaway!!!! What a sweet giveaway Terri! I would love to win those gorgeous fat quarters! I love the green needle book. They’re all so pretty but I’ve always had a thing for turquoise! I too love the henna collection. It has been one of my favorites too. I would have such a hard time picking which color is my fav…any and all!!! I don’t have any of the 2nd collection, but looking forward to buying some. BTW…I love your website. These are so sweet! I’d have a hard time choosing between lime green and red, my two favorite colors! I recently returned from vacation & had taken along a hand sewing project with 3 needles stuck in paper. I had lost all 3 before it was time to come home! That little needle book would have really helped! Love the raspberry! I’d love to be entered in this gorgeous giveaway…I LOVE the henna prints (but I don’t have any in my collection except for the red one…I HAVE to change that before it’s too late…in the shops I checked most of them were out of stock…~ so please, pick me 🙂 ). It’s hard to tell which one my favorite is…I love them all…maybe the blue one? Wow – you’re going to give away that beautiful fabric?? So generous of you! I really need a needlebook, and I’m thinking about making some for friends for the holidays. If I won, I’d love the brown one – only because the others are so cute, my daughter would want to steal it! i love the green needle book. it’s so pretty. thanks for the generous giveaway! Those needle books are so so cute! I love it in the henna garden print. I LOVE the turquoise one. The red needle book really sings to me. Thanks for the wonderful giveaway!! I get so much inspiration from your blog! Hello Terri, how kind of you to share these lovely things! That fabric looks wonderful in all colours and needle books are so beautiful all together in line! For the moment I like most the light green, first from left and also the pink next to green! I’m having a a hard time deciding between the turquoise and the purple! But really, they’re all so pretty! Wow, how thoughtful! I just love the green needle book but the brown and cream is really nice as well…. I love the green needle book. Thank you for your generosity! what beautiful fabric! I love the green needle book! I am so in love with the grey needle book! And the collection of fabrics is gorgeous! I like the fabric colors. Those books are pretty cool. When I travel I could use them to store my USB sticks. I love each and everyone. How does a person chose. You are so good and this puting together and making things so cute. I just love them. I would take anyone of them. I don’t have a color of choice. You chose. I don’t think I have seen that fabric either. It is really cute. I’d love the blue Hex needle book! The fabrics are great! They’re all too cute, but I think I would pick the coral one (4th in the picture). Thanks for a great giveaway! I absolutely love the blue one, the fabric is amazing. I love all them so I would be very happy with any! Such beautiful fabric! Oh what a wonderful giveaway. I loved those needle books when you posted them before and thought they were such a great little idea. I love the fabric you used for those too so I’d be thrilled to win some of that fabric. Awesome giveaway! I love all of the colors and would be ecstatic if I received any of them! Thanks for such a wonderful giveaway. I’m a new follower! They are all so nice Terri. I think I would choose the red one! I love all these henna prints! I couldn’t choose which needle holder so I asked my daughter and she said orange. I love the star in the middle of the brown one too, but I’ll go with her choice and say orange. 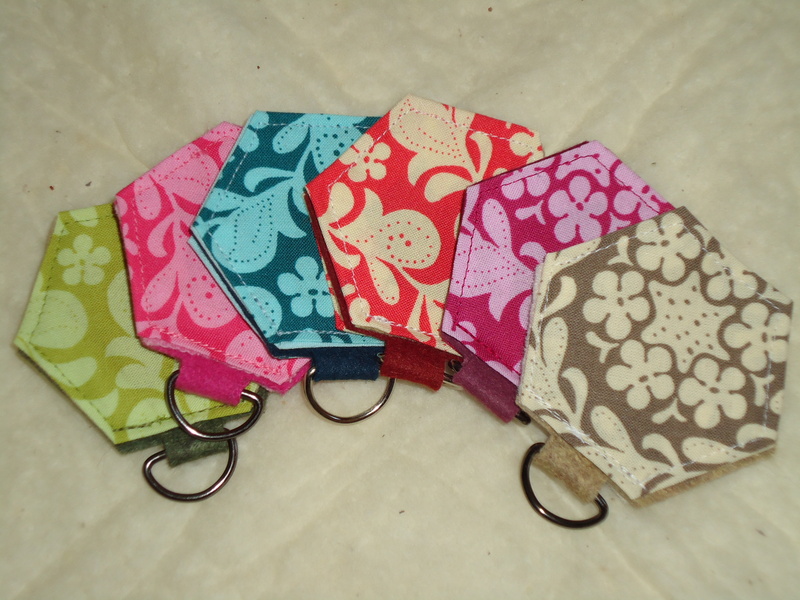 Glad you liked the decopatch tutorial Terri – wonder if you would be putting up a tutorial for those cute needle cases? If I was lucky enough to win, then I would say green :0) It is really kind of you to include us on the other side of the pond in your giveaway. These are super cute! I just realized I put mine together sideways! I’m such a dork! Whooo, finally go to the bottom. Well, I know I would like a stab at those henna prints. there are so many ideas that come to mind, especially as I have a quilt top that needs a border. Should I be lucky enough to win, I already know it is the green needle case I would want to accompany the fat quarters. I love the aqua blue one! Thanks for the great giveaway! Terri – I am a first time visitor to your blog and boy am I glad I did. You are super creative. I try and surround myself with goodness and craft a little everyday. Thanks for making me feel welcome. As far as the needle books go what a darling idea, especially as a gift (I am thinking for mom for sure) of course I would have to learn how to make them. The colors I love, besides them all, are the red, blue or green. Keep crafting and now you have been added to my favorites!!! These are adorable, I’m on such a red kick right now so that would have to be my fave. Great fabric!! BLUE !!! PIC ME ! I love them all but if I had to choose then probably the green …or the blue……! The hexagons are so cute and useful. Love the pink one. Thanks for the generosity Terri! I would choose the blue needle hexie if I were lucky enough to win. Those are so cute! I’d choose the red one. Thanks for the chance to win! These are great. I love the blue one! Wow Terri …. you must have read my mind 🙂 I’ve been looking for some Henna Garden and those needle books are so cute!! I would choose the red one … is it persimmon? Thanks for a wonderful giveaway!! 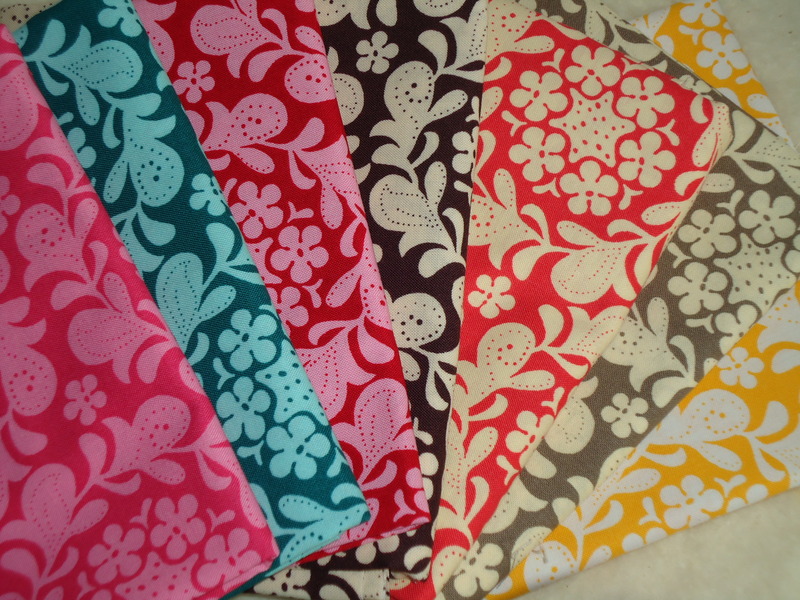 Oooo…gorgeous fabrics! And I LOVE your needle books. I would be thrilled with any one of them, though the red one seems to get my attention the most. I LOVE these prints and they come in so many great colors! I think I’d pick the blue needlebook. THANKS for the chance! Thanks for the giveaway Terri, the green needlebook is my favorite. I’ve only been able to find this fabric in pink so it would be nice to win your fat qtrs. Thanks for the chance! So pretty, especially all together. The blue one is my favorite, though.